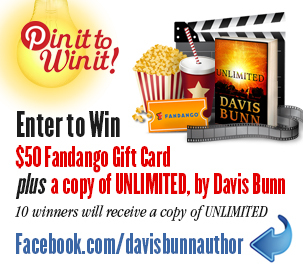 You could win a $50 Fandango gift card plus UNLIMITED, Davis Bunn's new suspense novel. 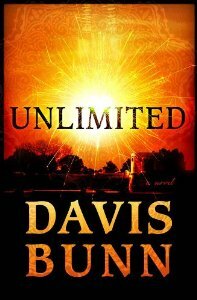 Ten additional winners will receive a copy of UNLIMITED. Enter right now by clicking this link: http://woobox.com/mp5qew. You can enter once per email address per day. Rack up bonus entries by sharing the contest with your Facebook and Twitter friends! If you don’t have a Pinterest account, enter by filling out the form on the Official Rules page here http://bit.ly/15vTr8u. Simon Orwell is a brilliant student whose life has taken a series of wrong turns. At the point of giving up on his dreams, he gets a call from an old professor who has discovered a breakthrough in a device that would create unlimited energy. He needs Simon's help. Upon crossing the border, nothing goes as the young man planned. The professor has been killed and Simon is assaulted and nearly killed by members of a powerful drug cartel. With Harold's help, Simon sets out on a quest to uncover who killed the professor and why. In due time, he will discover secrets to both the world-changing device and his own unlimited potential. Post by Davis Bunn, author.